With the coming of spring, all eyes are focused on the biggest event of its kind in the world, the Carole Nash International Classic MotorCycle Show that will take place at the Staffordshire County Showground over the weekend of April 22/23. 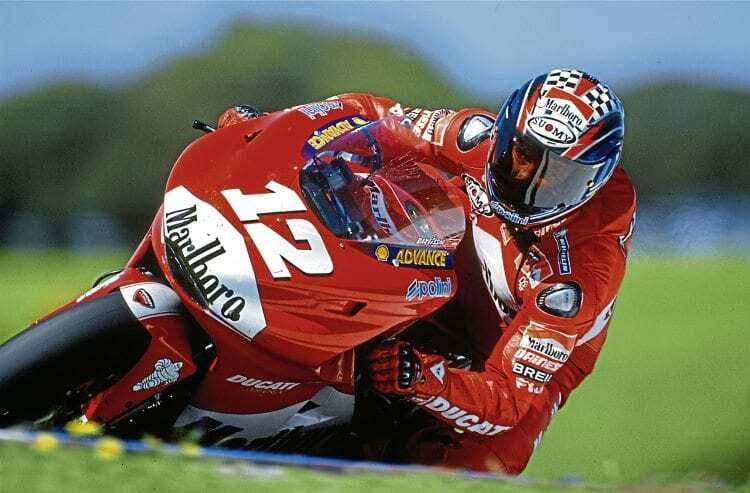 Guest of honour, triple World Superbike champion Troy Bayliss, is seen in typical fiery action. There, visitors will find row after row of stunning display machines, several halls and outside areas packed with club and trade stands galore and a vast bike jumbler’s paradise of pitches selling everything the dedicated restorer could possibly need. There’s a brilliant star guest in the shape of triple World Superbike champion Troy Bayliss, the always intriguing Bonhams Spring Sale, the firing up of famous race machines in the Classic Racer GP Paddock, demonstrations of balance and skill on the Classic Dirt Bike Experience trials course, and much more besides. By courtesy of the Sammy Miller Museum, gracing the stand of leading classic vehicle insurers Footman James will be two of the most exotic British racing machines ever built – a 1949 AJS Porcupine restored at the museum and similar to the one on which Les Graham won that year’s 500cc World Championship, and a supercharged, liquid-cooled 1939 AJS V4 that became the first motorcycle to do a 100mph lap in a Grand Prix event – the Ulster GP of 1939. With the FIM’s decision to ban supercharging by the end of 1946, however, this fabulous piece of British engineering was shelved. A one day adult ticket is just £12 when bought before the advance ticket deadline, with a further £1 saving for senior citizens. A one-day pass for under 12s is £3. You can get yours online by visiting staffordclassicbikeshows.com or by calling the customer services team on 01507 529529. Closing date for advance ticket sales is 23:59 on Monday 17th April 2017. Gates open: 9am-6pm on Saturday and 9am-5pm on Sunday.